Turtle Bay has been impervious to reform largely because most U.N. budgets are financed through effectively mandatory contributions. Under this system, calculated by a “capacity to pay” formula, each U.N. member is assigned a fixed percentage of each agency’s budget to contribute. The highest assessment is 22%, paid by the U.S. This far exceeds other major economies, whose contribution levels are based on prevailing exchange rates rather than purchasing power parity. China’s assessment is just under 8%. Why does the U.S. tolerate this? It is either consistently outvoted when setting the budgets that determine contributions or has joined the “consensus” to avoid the appearance of losing. Yet dodging embarrassing votes means acquiescing to increasingly high expenditures. The U.S. should reject this international taxation regime and move instead to voluntary contributions. This means paying only for what the country wants — and expecting to get what it pays for. Agencies failing to deliver will see their budgets cut, modestly or substantially. Perhaps America will depart some organizations entirely. This is a performance incentive the current assessment-taxation system simply does not provide. As an assistant secretary of state in the George H.W. Bush administration, I worked vigorously to repeal a hateful United Nations General Assembly resolution equating Zionism with racism. Foreign diplomats frequently told me the effort was unnecessary. My Soviet counterpart, for example, said Resolution 3379 was only a piece of paper gathering dust on a shelf. Why stir up old controversies years after its 1975 adoption? We ignored the foreign objections and persisted because that abominable resolution cast a stain of illegitimacy and anti-Semitism on the U.N. It paid off. On Dec. 16, 1991, the General Assembly rescinded the offensive language. Now, a quarter-century later, the U.N. has come close to repeating Resolution 3379’s original sin. Last week the U.N. showed its true colors with a 128-9 vote condemning President Trump’s recognition of Jerusalem as Israel’s capital. While imposing financial repercussions on individual governments is entirely legitimate, the White House should also reconsider how Washington funds the U.N. more broadly. Should the U.S. forthrightly withdraw from some U.N. bodies (as we have from UNESCO and as Israel announced its intention to do on Friday)? Should others be partially or totally defunded? What should the government do with surplus money if it does withhold funds? Despite decades of U.N. “reform” efforts, little or nothing in its culture or effectiveness has changed. Instead, despite providing the body with a disproportionate share of its funding, the U.S. is subjected to autos-da-fé on a regular basis. The only consolation, at least to date, is that this global virtue-signaling has not yet included burning the U.S. ambassador at the stake. Start with the U.N. Human Rights Council. Though notorious for its anti-Israel bias, the organization has never hesitated to abuse America. How many know that earlier this year the U.N. dispatched a special rapporteur to investigate poverty in the U.S.? American taxpayers effectively paid a progressive professor to lecture them about how evil their country is. The U.N.’s five regional economic and social councils, which have no concrete accomplishments, don’t deserve American funding either. If nations believe these regional organizations are worthwhile — a distinctly dubious proposition — they are entirely free to fund them. Why America is assessed to support them is incomprehensible. Next come vast swaths of U.N. bureaucracy. Most of these budgets could be slashed with little or no real-world impact. Start with the Office for Disarmament Affairs. The U.N. Development Program is another example. 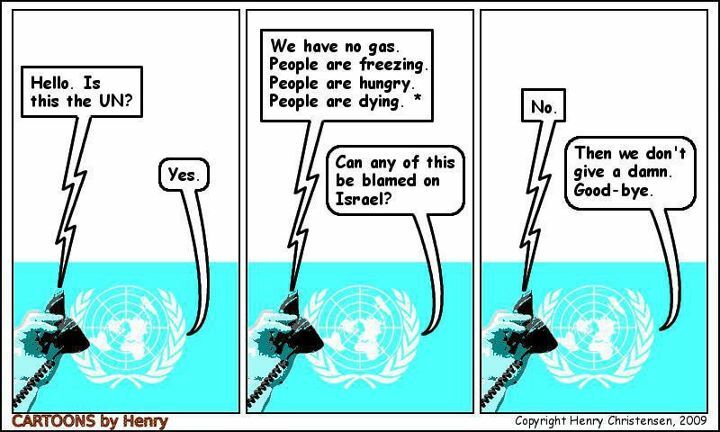 Significant savings could be realized by reducing other U.N. offices that are little more than self-licking ice cream cones, including many dealing with “Palestinian” questions. The U.N. Relief and Works Agency for Palestine Refugees (UNRWA) could be consolidated into the U.N. High Commissioner for Refugees. Many U.N. specialized and technical agencies do important work, adhere to their mandates and abjure international politics. A few examples: the International Atomic Energy Agency, the Food and Agriculture Organization and the World Health Organization. They shouldn’t be shuttered, but they also deserve closer scrutiny. Some will argue incorrectly that unilaterally moving to voluntary contributions violates the U.N. Charter. In construing treaties, like contracts, parties are absolved from performance when others violate their commitments. Defenders of the assessed-contribution model would doubtless not enjoy estimating how often the charter has been violated since 1945. If the U.S. moved first, Japan and some European Union countries might well follow America’s lead. Elites love the U.N., but they would have a tough time explaining to voters why they are not insisting their contributions be used effectively, as America has. Apart from risking the loss of a meaningless General Assembly vote — the Security Council vote and veto being written into the Charter itself — the U.S. has nothing substantial to lose. Thus could Mr. Trump revolutionize the U.N. system. The swamp in Turtle Bay might be drained much more quickly than the one in Washington. John R. Bolton, former U.S. Ambassador to the United Nations, is Chairman of Gatestone Institute, a senior fellow at the American Enterprise Institute, and author of “Surrender Is Not an Option: Defending America at the United Nations and Abroad”. The United Nations Security Council is meeting in closed session Monday morning to discuss the crisis. Sweden, Egypt and France requested the special meeting. None of these countries have supported Israel in dealing with the ever present threat of Palestinian terrorism. They have bought into the Palestinians’ victimhood narrative. A Palestinian mother extolled her 19-year old son’s “accomplishment” in the name of Allah. She exclaimed: “Praise Allah. I am proud of my son. May Allah be pleased with him.” The mother was not celebrating her son’s graduation, new job, marriage, fatherhood or some other life-affirming event. Rather, she was celebrating the deaths that her terrorist offspring, Omar al-Abed, brought to a Jewish family on July 21st. The family was about to sit down for a Sabbath dinner and to celebrate the birth of a grandson that same day when the Palestinian terrorist prodigy invaded the family’s home. Wielding a knife, he proceeded to kill a grandfather, his daughter and his son, and to seriously wound the grandmother. The massacre ended only after a neighbor, who belongs to an elite IDF unit and was home on leave, heard cries for help from the house and shot the terrorist. 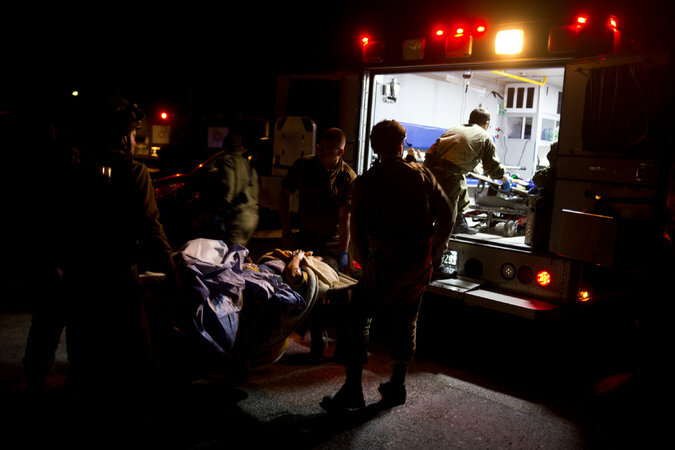 Al-Abed was eventually handcuffed and taken to a hospital for treatment of his wounds. The trigger for this latest spurt of violence was said to be Israel’s decision to install metal detectors at the entrances leading to the Temple Mount. Israel took this action in response to the killings by terrorists on July 14th of two Israeli police officers guarding the holy site. The murders were carried out by Arab Israeli citizens who used guns previously smuggled into the compound. Israel installed metal detectors to prevent any further smuggling of arms. Palestinian violence has been spreading since then, resulting in the deaths of four Palestinian rioters in confrontations with Israeli security forces trying to restore calm. The spiraling violence is being spurred on by Muslim religious leaders and Palestinian officials claiming that Israel’s security actions were defiling the Al Aqsa mosque situated on the Temple Mount. Omar al-Abed picked up on this theme in the “will” he posted on Facebook three hours before his cowardly attack. He said he was acting against “the sons of apes and pigs who defile Al Aqsa.” Hoping for martyrdom, he posted: “I will go to heaven. How sweet death is for the sake of God, his prophet and for Al-Aqsa mosque.” The 19-year old terrorist, who is the apple of his mother’s eye, did not get his wish and will now have to answer for his crimes. No doubt, Palestinian Authority President Mahmoud Abbas will reward the terrorist’s family with a generous stipend while he remains in Israeli custody. That’s the way Abbas operates. After first mouthing an insincere condemnation of the murderous attack on the police guarding the Temple Mount, Abbas has exploited the situation ever since. He announced that he was going to suspend all contacts with Israel until the metal detectors were removed. Abbas reached out to the United States and the so-called “international community” to pressure Israel into cancelling its heightened security measures. He reportedly said that unless Israel backed down, tensions over access to the holy site could spiral out of control. The United Nations Security Council is meeting in closed session Monday morning to discuss the crisis. Sweden, Egypt and France requested the special meeting. None of these countries have supported Israel in dealing with the ever present threat of Palestinian terrorism. They have bought into the Palestinians’ victimhood narrative. However, it is unlikely that any alternative security measure the Israelis institute will quell the rising level of violence. Indeed, it could have the opposite effect. Already, Abbas is said to be protesting the installation of the cameras. Only the Palestinians have the right to determine what security measures are appropriate outside the entrance to the site of their mosque, he said on Sunday. Moreover, some Muslim religious leaders may argue that photographing of people and other living animate moving beings is forbidden in Islam. They would likely rail against the “Zionist infidel occupiers” taking pictures of Muslim worshippers entering the “sacred” site of a mosque over which the Palestinians claim exclusive sovereignty. Palestinians continue to reject all paths to a reasonable compromise on any issue related to the conflict that they created in the first place by not accepting a two-state solution seven decades ago. There is no reason to expect any different outcome this time. As Debkafile put it so well: “The Palestinians are consistent in their tactics: First shed Israeli blood, then tell the world they are victims and as martyrs are justified in seeking revenge.” As usual, much of the “international community,” as represented in the UN, will fall for this charade. The declaration signals a vast departure from the Obama administration, which, in its final days in office, helped craft and garner support for a fiercely anti-Israel resolution. The Obama administration’s efforts, which were widely condemned by Israel and U.S. pro-Israel groups, broke with decades of U.S. policy when it promoted this effort. The Trump administration will boycott the United Nation’s Human Rights Council, or UNHRC, due to its efforts to advance an anti-Israel agenda, according to senior administration officials familiar with the effort who spoke to the Washington Free Beacon. The UNHRC, which includes member countries cited for mass human rights abuses, is poised on Monday to adopt at least five anti-Israel resolutions, prompting outrage in the Trump administration over what officials described as the council’s unjust bias against the Jewish state. The action on these items has prompted the Trump administration to boycott the council and refuse to attend the Monday meeting, according to administration officials apprised of the situation who spoke with the Free Beacon. 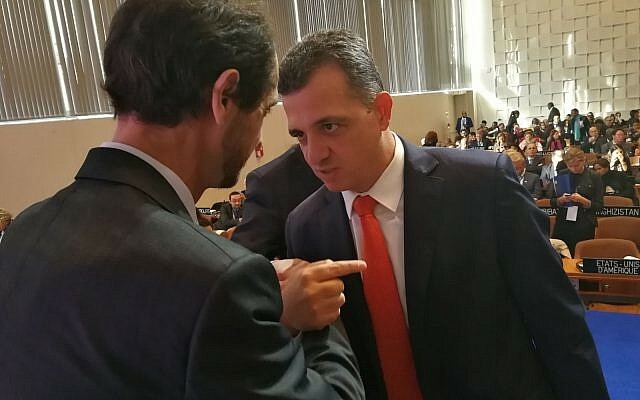 The boycott comes on the heels of the resignation of a Jordanian U.N. official who had sought to advance an anti-Israel agenda opposed by the United Statesand other nations. Trump administration officials said the increased pressure on the U.N. is part of a larger effort by U.S. Ambassador Nikki Haley to significantly reform the international organization and root out those who use it as a platform to push anti-Israel initiatives. On Monday, the UNHRC is set to consider an agenda known as the “human rights situation in Palestine and other occupied Arab territories.” It is said to include several anti-Israel declarations that the Trump administration fiercely objects to. Senior Trump administration officials who spoke to the Free Beacon said the upcoming resolutions affirm the U.N.’s unacceptable bias against Israel, which remains the only member nation that has specific agenda items aimed against it. The efforts to criticize Israel threaten the council’s credibility and are said to have motivated the Trump administration to boycott Monday’s meeting. Haley and other senior administration officials have determined that this anti-Israel bias must be addressed before the U.S. rejoins the council and gives it legitimacy, according to sources. The Trump administration told the Free Beacon it is fully committed to voting against “every resolution” targeting Israel and that it will encourage allies to do the same. Newly installed Secretary of State Rex Tillerson stated recently that the United States intends boycott the UNHRC until it implements much needed reforms, chiefly its anti-Israel bias. The latest move is meant to bolster this policy and send a message that the UNHRC’s bias against Israel must cease before the U.S. considers the group legitimate. The Trump administration intends to vote against every U.N. resolution against Israel and will urge other nations to do the same, according to officials. The administration also is pushing other nations to criticize the UNHCR’s anti-Israel bias and promote significant reforms. The recipient of the “apartheid” segregation of public facilities, social events, housing and employment are the JEWS and not the Arabs! For those of you who have been reading what I have been writing over the past many years, you may be a little surprised (shocked?) to read the title of this post. Hang in there–it is not what you think. First, a word about definitions: “Apartheid,” is a word rooted in Afrikaans, which was a system of institutionalized racial segregation and discrimination in South Africa between 1948 and 1991. Apartheid was delineated into petty apartheid, which entailed the segregation of public facilities and social events, and grand apartheid, which dictated housing and employment opportunities by race. Yesterday, the United Nations, in yet another anti-Israel move, proffered a report that accuses Israel of having established “an apartheid regime that oppresses and dominate the Palestinian people as a whole.” Almost immediately, the expected castigation of the UN began along with calls to stop funding the UN. 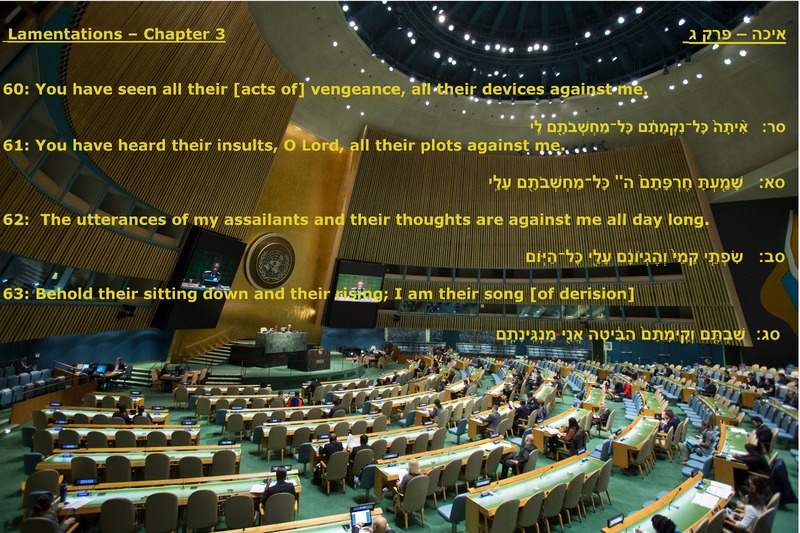 While I am NO fan of the United Nations, I think they got it right this time…with one minor exception. The recipient of the “apartheid” segregation of public facilities, social events, housing and employment are the JEWS and not the Arabs! If we take a look at Israeli society, we can come up with thousands of places that Arabs are gainfully employed both inside and outside the so-called “Green Line.” Arabs serve in our court system; major corporations; study in nearly every university or other higher-education facility in Israel; travel our buses and trains; drive our buses and trains; serve as Members of Knesset; doctors and nurses in all Israeli hospitals; are treated as patients in all hospitals…and so on, and so on, and so on. Arabs enter into Judea and Samaria on a regular basis, both to work and to shop. Arabs are undoubtedly woven into the fabric of most of Israeli society. They can even freely walk on the Temple Mount (even playing soccer, G-d forbid!) and visit any holy site they wish to visit. As long as there is not a heightened level of a security threat, Arabs living in Israel enjoy more freedom that most of their brothers in other Arab countries could only dream of. Jews can not and do not work in the so-called “territories.” Jews do not drive Arab buses. Jews do not serve on any Arab city or municipal council. Jews are HIGHLY restricted from ascending the Temple Mount (the HOLIEST site in Judaism). Jews are not permitted to build homes where and when they wish. We can’t be treated in their hospitals. Bottom line: Jews are barred from nearly all strata of Arab society, while Arabs have entrè to nearly every strata of Israeli/Jewish society. Arabs continually incite to violence in their schools. Imams preach hate on a daily and weekly basis from the mosques. Jews are vilified by Arabs in so many Arab sectors. So, my dear United Nations, I ask you…how exactly do you see Apartheid in Israel? Because from where I am sitting, it is the JEWS who bear the brunt of that Apartheid character you so assail.